Sofia Hultén reverses the idea that sculpture should be static and unchangeable. Armed with time, the artist approaches the material and asks: “What if?” And there it is – each thing or material may have several different stories, bound to time, possible uses, and imagination. She is the Master who meddles in the objects’ fateful stories, reflecting on their past, and who can affect their future with the slightest intervention. Their natural causality has been disconnected in the work, Reality Plural (2015), where the familiar suddenly becomes exotic through the artist’s manipulation of the narrative. In the work, Particle Boredom (2016), Hultén has collected found wooden fibreboards and made casts of them. She then ground them to pieces, and finally cast them again. The viewer should at first be oblivious of the process behind the work, even though radical changes have taken place in the work’s composition. Hultén has thus intervened in a quite mundane story in a very miniscule way. However, the viewer may immediately start to question how this unsolicited intervention affects the course of events. Can the wings of a butterfly in a distant part of the world really cause a storm up here? Sofia Hultén finds her material almost without exception in prosaic found things. During the process she starts procedures that may involve repairs on broken or worn things, which are thus renewed and/or given new purpose. She uses precise and meticulous methods, which are usually reserved for crime investigation, and she has fixed furniture or recreated their wretched state, which leads us to wonder what the original or “authentic” state is. This is evident in Truckin’ from 2015. 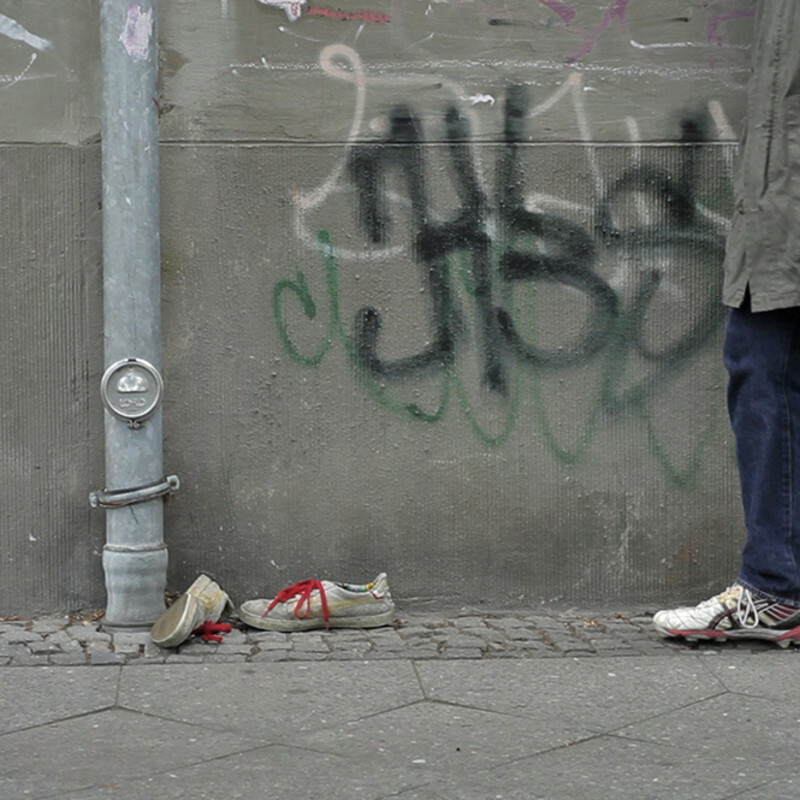 In the video, we see the familiar sight of an abandoned pair of trainers in the open. The artist first exchanges the trainers she is wearing for a found pair, then continues to exchange the shoes she is wearing with other found pairs. She is an agent of the ordinary and it is hard to tell if her diligence changes anything in everyday life or has any effect on the course of events. The materials are often sourced from large industry and construction, where every tool and device has a distinct and defined purpose. All deviations from this predetermined purpose seem ridiculous and comical. The artist’s transformation distorts and takes the tool away from its use, but is also the beginning of a new story or process that may possibly end with returning the thing back exactly as it was to begin with. Time is the force that conquers all in the end, and in the end everything disappears. Art, however, can momentarily stop time, change its course. Hultén uses simple measures that lead to the same moment repeating itself over and over, or to the course of events taking place in a parallel existence, she can make time flow backwards, stand still, or speed up. In the end no one can be sure of the truth or legitimacy of linear time.